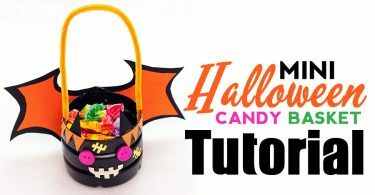 If you’re looking for healthy alternatives to Halloween candy or healthy Halloween snacks for school parties, then you’ll love today’s DIY edible Halloween craft. 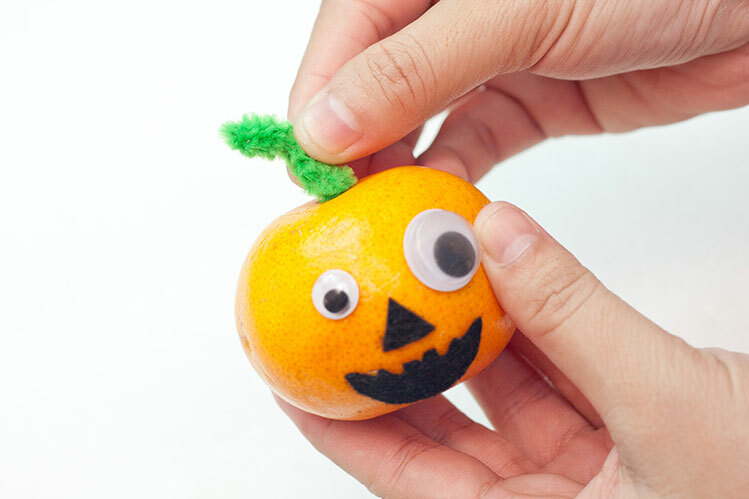 I’ll show you a fun, creative, and easy way to turn a small orange or mandarin into a cute pumpkin. These orange “pumpkins” are one of my favorite healthy Halloween fruit treats. They are also kid-friendly. My daughter LOVES these – both eating them and making them. 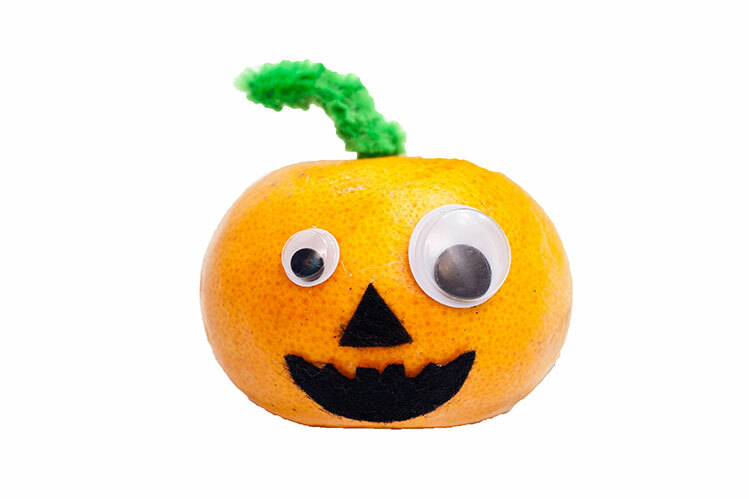 Hand out your oranges to trick or treaters as a healthy alternative to candy, or take them to school parties for your preschoolers and kindergartners. 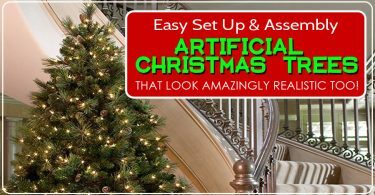 They also make great decorations and finger food for your Halloween parties or cute gifts for your friends, neighbors, or co-workers – pretty much anyone you want to wish a Happy Halloween! As a parent, I’m always concerned about my daughter’s health. I’m always looking for healthy things to give out on Halloween to balance out all the candy and sweets I know she’ll be getting elsewhere. At the same time, I don’t want to be “that” parent who all the trick or treaters avoid because I hand out something like dental floss. ICK! These oranges are the perfect compromise to replace candy with healthy Halloween treats, and I still get to be the “cool mom”! Win! Win! I also like these because they are peanut and tree nut free, so kids with food allergies can still enjoy them too! 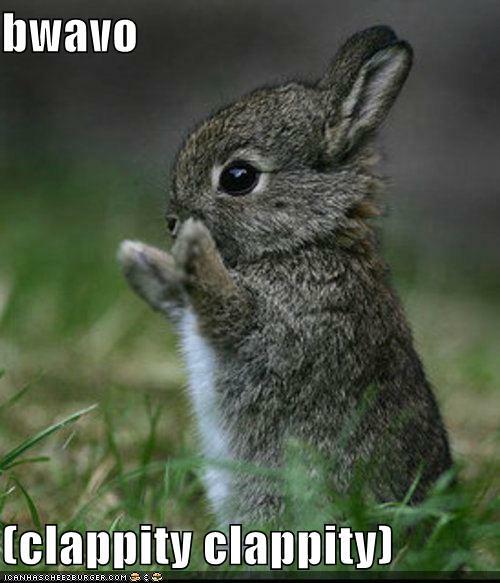 Everyone loves a Cutie, right? 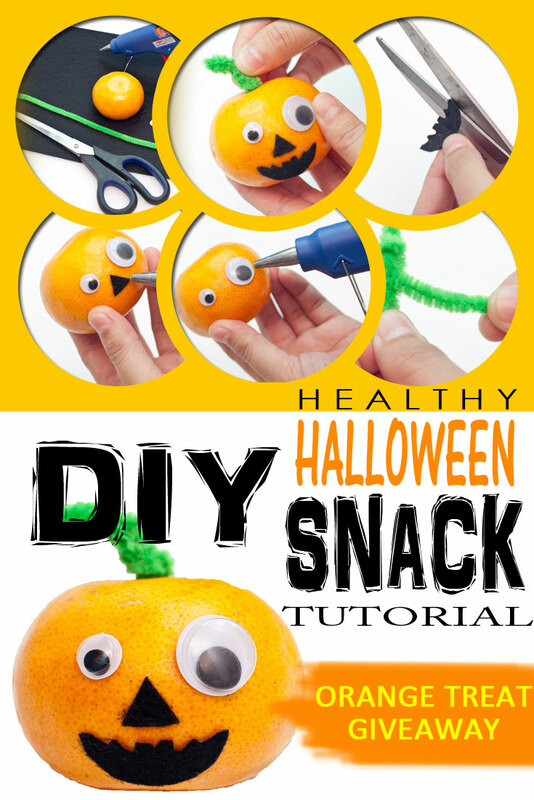 So grab your oranges and let’s make some yummy healthy Halloween snacks you can keep for yourself or give away! 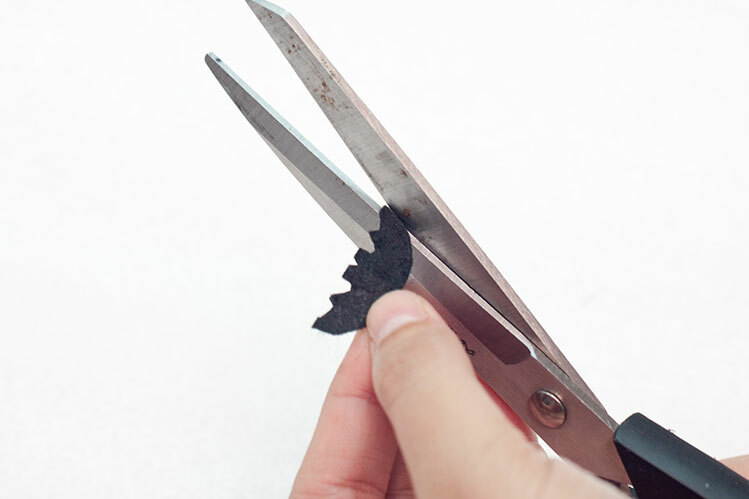 Cut a small triangle from the piece of black craft felt. 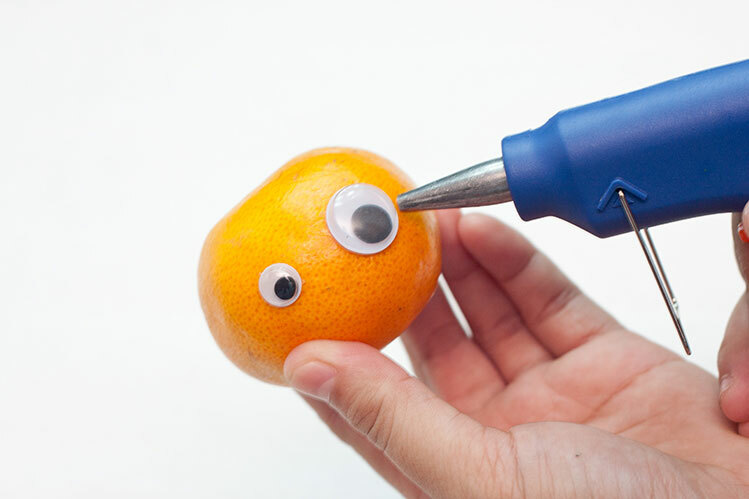 Next, hot glue the triangle between the eyes to form a nose. Use the black craft felt again and cut out a small mouth for the Halloween orange. I cut out a half-moon shape and then gave it some character, with a few interesting cut-outs on one side. There’s no right or wrong way to create the mouth, so experiment and see how many different fun shapes you can come up with. Changing the shape of the mouth will give your healthy Halloween snacks an entirely new personality. For example, you can make them appear happy, sad, spooky, angry, scary, surprised, concerned and more just by shaping the mouth a different way. 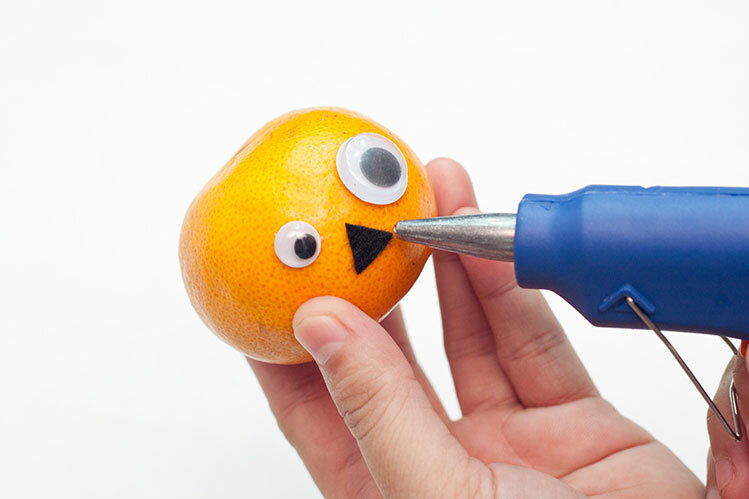 Once you have the mouth shape you want, hot glue it to the orange. 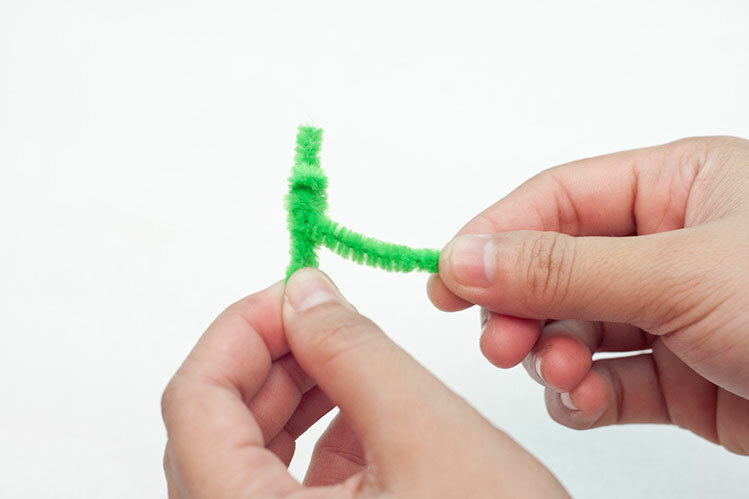 Take the green pipe cleaner and fold it to create a piece that is about 4 to 5 cm (1.5 to 2 inches) long. The excess part that’s left over after folding can be used to reinforce the stem and make it sturdier. Simply wrap the excess around the rest of the stem as shown. 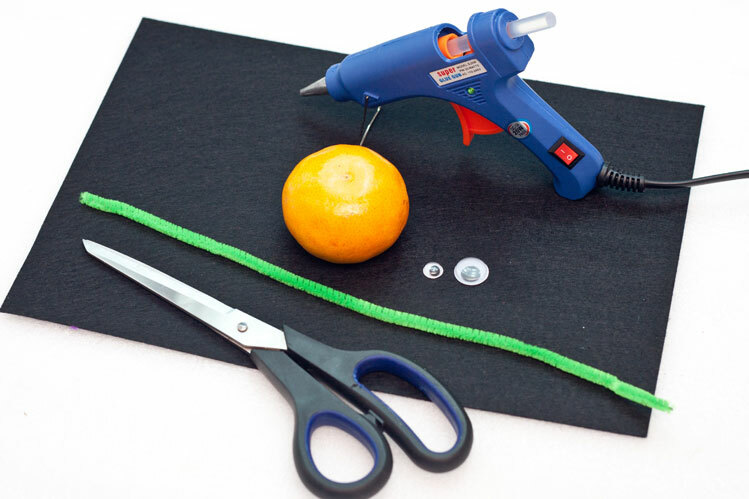 Carefully insert the pipe cleaner into the top of the orange to finish off the stem. If necessary, strip off some of the “fuzz” from the lower part of the pipe cleaner to make insertion easier. That’s all there is to it! 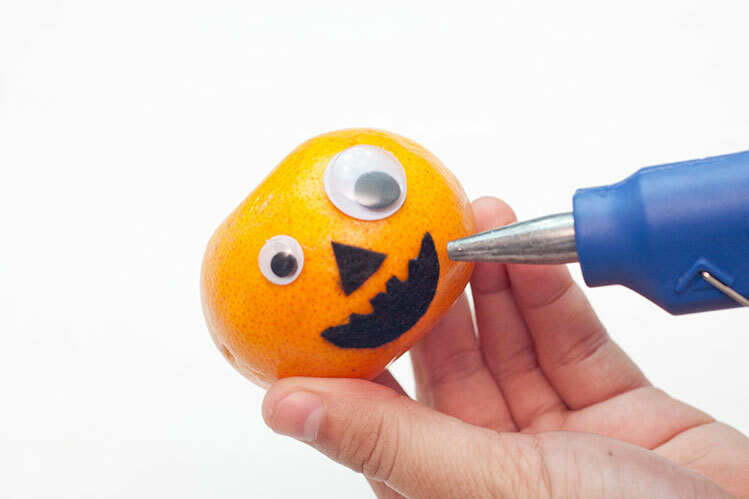 With a little creativity, you can find lots of ways to stay healthy during Halloween. You now have a quick and easy healthy Halloween snack for home, the classroom, office parties, or get togethers with family and friends. Enjoy your fruit treats and get ready for the trick or treaters! 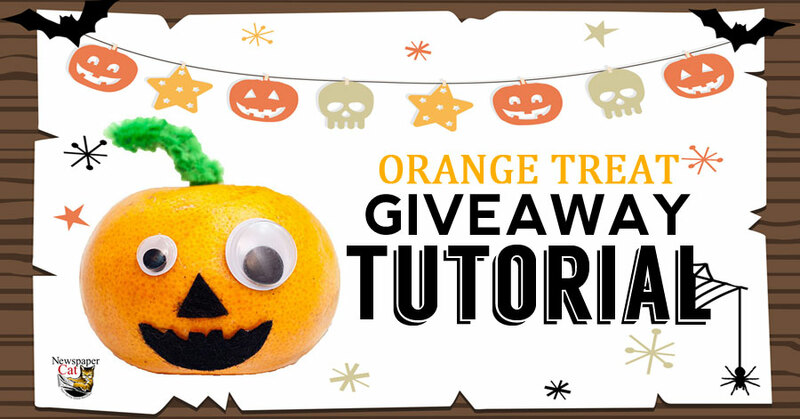 For Pinterest Lovers: If you enjoyed this Orange Treat Giveaway Snack Tutorial and want to save it for later or share it with friends, simply use the image below to pin it to your board! Easy peasy!